Thank you for electing me again as your Democrat nominee to serve District 147 with an overwhelming 81.2% of the vote. It has been an honor to serve our home for 26 years. I will continue to work hard during the interim preparing for the 86th Legislature if I’m re-elected in November. 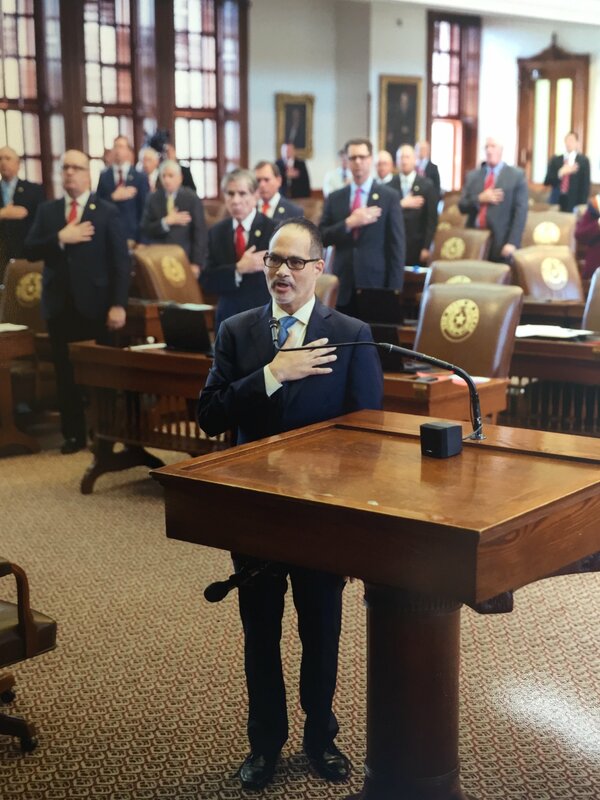 Representative Coleman leading the Pledge of Allegiance in the Texas House of Representatives in Austin during the 2017 Legislative Session. Thank you Houston Community College(HCC) Black History Committee for awarding me the “Unstoppable Leader Award” at the 12th annual Black History Scholarship Gala on February 24th. I am honored to receive such an award during Black History Month. The HCC Black History Scholarship Gala raises funds to support educational opportunities for students at HCC. The gala is part of the HCC Foundation, an organization that provides college scholarships for HCC students. Congratulations to the other community members who were also recognized as “Unstoppable Leaders”: Houston Independent School District Board Chair Rhonda Skillern-Jones, Wheeler Avenue Baptist Church Senior Pastor Marcus D. Cosby, entertainment attorney Ricky Anderson and veteran sports journalist Ralph Cooper. HCC’s Black History Committee bestowed a posthumous lifetime achievement award on William Harmon, who was president of HCC’s Central Campus from 2005 to 2016. Click here for coverage of the event from the Houston Chronicle. 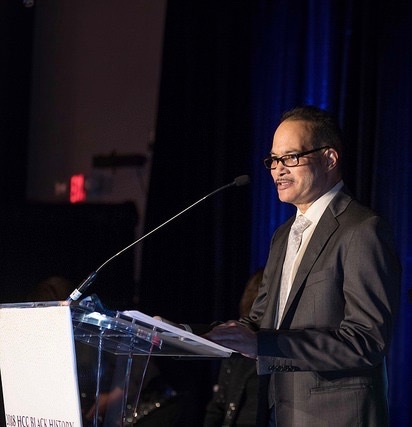 Representative Coleman at the HCC Black History Scholarship Gala, where he was awarded the “Unstoppable Leader Award” on February 24th in Houston. Congratulations to my colleagues in the Texas Legislature on winning their primary races. Congratulations to Senator Sylvia Garcia for winning the Democratic nomination for Congressional District 29. Senator Garcia and former El Paso County Judge Veronica Escobar are on their way to becoming the first ever Latina members of Congress from Texas. Please see below for the Democratic primary election results, as well as information for the run-off election to be held in May. Governor – Andrew White & Lupe Valdez are heading to May’s run-off election. District 142: Harold V. Dutton, Jr.
Rozzy Shorter and Marilyn Burgess are heading to May’s run-off election. Diane Trautman and Gayle Young Mitchell are heading to May’s run-off election. Dylan Osborne and Cosme Garcia are heading to May’s run-off election. Danyahel (Danny) Norris and Prince E. Bryant II are heading to May’s run-off election. Sharon Burney and Cheryl Elliot Thornton are heading to May’s run-off election. The run-off election will take place on May 22nd. If you did not vote or were not registered to vote in the March primary, you can still register and vote in the run-off election. However, if you voted in one party’s primary, you cannot vote in the other party’s run-off.Early voting for the primary runoffs will take place from May 14 through May 18. Click here for more information from the Texas Tribune about the May run-off election. Project Row Houses is unveiling a new exhibit this weekend with a community event to celebrate. Project Row Houses is hosting an opening for Neighborhood Fantasies, which integrates the spirit of an emerging art photographer Evan Coleman with the work of PRH founding artist Jesse Lott. The opening is tomorrow, Saturday, March 10th and the exhibit will run through April 22nd. Please see below for details. Below is an explanation of the exhibit from Project Row Houses. Curated by Kathleen Coleman in conjunction with Fotofest 2018. “Neighborhood Fantasies integrates the spirit of an emerging art photographer Evan Coleman with the work of PRH founding artist Jesse Lott. Join us March 10 from 4-6pm as we open this exhibition, presented in conjunction with Fotofest 2018. This exhibition is curated by Kathleen Coleman. The Houston urban landscape is an eclectic image of symbolic eras in time. The photographer Evan Coleman has captured the images of homes, office buildings, flora, fauna, roads, and houses; front yards where a person rides in a car or walks down a major street and a back road, familiar depictions portrayed in photo montages such as: a trailer, hamburger joints, resale businesses or party events are included. There are familiar images in the collages–a water hose, a variety of mangos, giant watermelons floating across the sky to create everyday dreams as we ride along. Let us not forget the porcelain cats resting in the window of a house, in a day dream; a central, focal image throughout the exhibition. The fantasy photo of a windowsill of cats is inviting Jesse Lott, who inserted a dog to peer at them through the window. 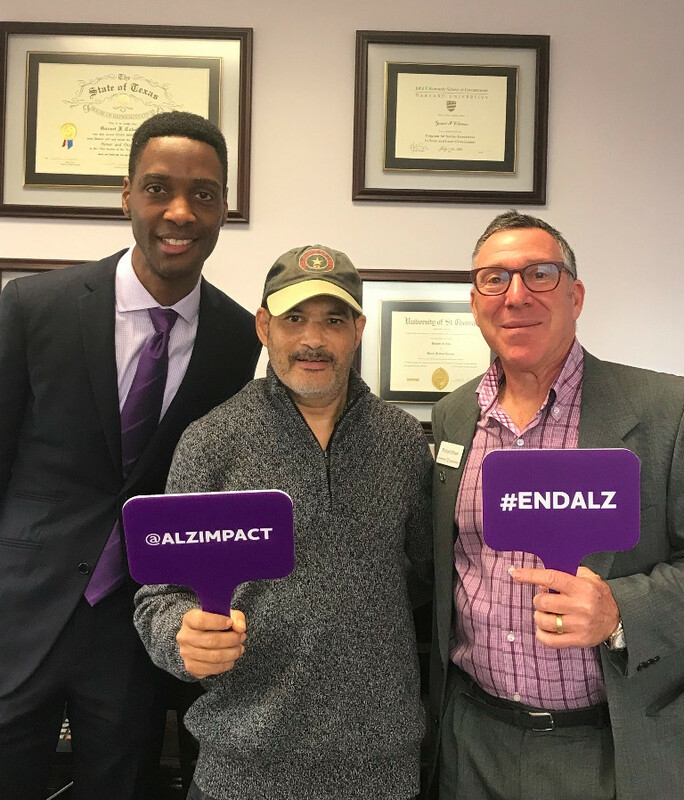 Thank you to Richard Elbein (CEO of the Alzheimer’s Association), and Dr. Steven Starks for meeting with me on Thursday on your annual advocacy day. Thank you for everything you do to help fight for a cure and to help the families with loved ones suffering from Alzheimer’s. From left to right: Richard Elbein, CEO of the Alzheimer’s Association, Representative Coleman, and Dr. Steven Starks in Houston on March 8, 2018. The Houston Museum of African-American Culture is celebrating the life of Ms. Sandra Bland with an interactive exhibit. The exhibit has been extended and now runs until March 28. See below for hours and details. Click here for more information. Photo courtesy of African American News. General Admission to the museum is free, however donations are accepted. by Aretha Franklin featuring Annie Lenox.